This is Part 2 of our winery visit in Oliver. Click here to read about our experience at Le Vieux Pin and Stoneboat. Driving by more rows of vines, we had arrived at our next stop. 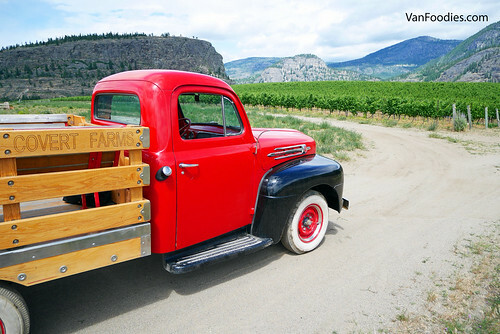 We pulled into the driveway of Church & State Wines, a bigger winery with two locations, one in Oliver and another in Victoria. It charges $8 for 4 wine samples, and waived when purchasing two bottles of wine. Many people go camping on the Labour Day long weekend, taking advantage of the last few days of summer. We were no exceptions. This past Labour Day weekend, Mr. and I, along with CC and DF, went camping in Oliver. You know what Oliver is known as? 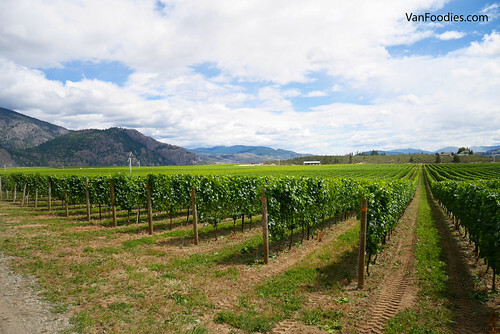 The Wine Capital of Canada! Obviously we didn’t waste our 4.5 hour drive to Oliver – we spent quite some time at local wineries, and here are some highlights. The Oliver/Osoyoo area has two premium growing areas, known as the Golden Mile (along Highway 97) and Black Sage Bench. As suggested by its name, the Black Sage Bench covers the dozen or so wineries along Black Sage Road. Just about every square inch is filled with grape vines.